Seychelles Resort recently opened in the Summer of 2006 and is located on the prime east end of Panama City Beach next door to Schooner's and close to beautiful St. Andrews State Park. Come and enjoy the powder white sand and turquoise blue waters at one of the finest and newest beach resort condominiums on Panama City Beach. Walk past the two beautiful pools and hot tubs directly onto the sand and beautiful waters of the Gulf coast. This particular condo is one of only a few units in the building with the premium floor plan which offers a 25 foot wide balcony and spectacular ocean views from the den as well as from the master bedroom. Most of the standard units at Seychelles have a 15 foot wide balcony and they have no ocean view or balcony access from the master bedroom. The premium floor plan also offers a second small bedroom as opposed to bunks built into the hallway wall. The premium units offer a greater level of privacy within the unit. The unit can accommodate 5-6 people with its king master bed, two twins beds, and a new dual power fully reclining sofa very comfortable for sleeping. This unit Is owned by the original owners purchased when new in 2007. Beautifully and professionally decorated by Beach Imports of Panama City. It is furnished and decorated in a plush and luxurious West Indies style throughout. Come and enjoy the spectacular views and the and the beautiful beaches that this condo has to offer. This condo features an ocean-view master suite with it's own private bath and it's own access to the large 25 foot wide balcony. It is decorated with a Tommy Bahama style bed with matching nightstands, a large matching dresser and mirror, a flatscreen TV. The plush king bed is decorated with beautiful bedding and soft, luxurious pillows. The private bath features double sinks, a large mirrored closet, a convenient cushioned bench seat, and hair dryer. The smaller second bedroom features two twins beds with very nice mattresses as opposed to the standard bed mattress pads. It is appointed with a very nice nightstand with storage as well as an additional storage cabinet and also has a 20' flatscreen TV. The second full-bath is conveniently located directly across the hall from the second bedroom. The den features a new dual fully reclining power sofa, wicker style coffee table, two West Indies style recliners, gorgeous end tables and lamps, West Indies style ceiling fan, beautiful tropical artwork, and a 40' Samsung flatscreen TV. It also includes 3 new bar stools purchased in January 2016. I also installed LG brand full size front-load washer and dryer in the condo recently to replace the small capacity units which were installed by the developer. New carpet was installed in January 2016. There are also recently installed very nice black-out drapes in the den and master bedroom. The upgraded kitchen features stainless appliances, cherry wood cabinets, as well as high-end blender, toaster, coffee-maker, can-opener, and kitchen accessories (all Cuisinart and KitchenAid). It includes complete dinnerware and top-of-the-line cookware, cutlery, and utensils. The unit also features a washroom with washer and dryer, ironing board and iron. 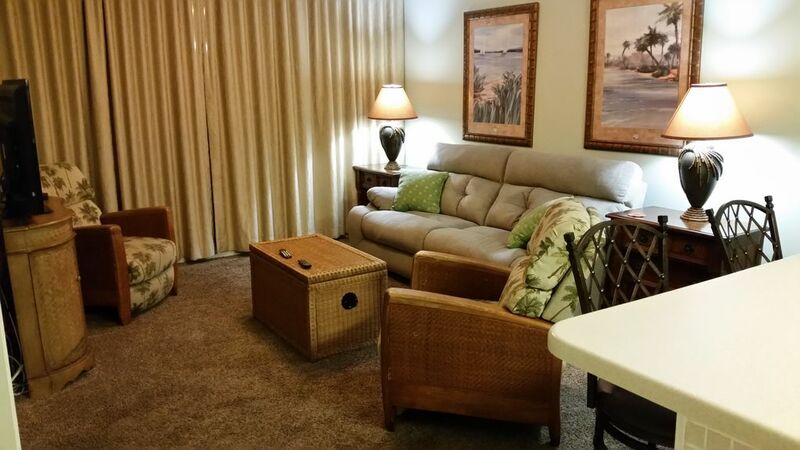 There are four comfortable beach chairs and a cooler in the unit for use during your stay. The oversize balcony features a tropical glass-top table which has two cushioned chairs with ottoman's and two beautiful cushioned chaise lounges for total patio relaxation. The huge patio balcony also offers total privacy from other condo guests and the views from this 21st floor balcony are truly amazing. A pair of binoculars is also provided for you to view the boats and beach scenery from the balcony. Everything about this condo is high-end and top-of-the-line. It was designed and decorated to offer a vacation in comfort and surrounded in luxurious accomodations. If you decide to stay here you will likely want to return to this condo on your future vacations to the Panama City Beach area. Take a look at the pictures and let me know about your travel plans or to answer any questions that you might have. Hope we have you as our guest soon! And if you have a need for larger gatherings of family or friends we also offer a beach house rental which is only a short walk from Seychelles Resort. The beach house can be viewed by going to VRBO listing #26340. The 3 bedroom beach house is located within 100 yards of the beach and offers a front courtyard as well as upper and lower patio/deck with water views on the rear of the house. There is ample parking for at least 4 cars and a large boat and the all sand yard features 5 large palm trees and many beautiful tropical plants. What could be better for large groups than a gorgeous condo and a beautiful large beach house a short walk from Seychelles Resort! The beach house is also very affordable and well worth the rental. I live in Germantown,TN and love Panama Cty Beach. Beautiful beaches, and close to best restaurants. 25 foot wide balcony with incredible beachfront views! High-speed internet service provided free of charge. Wireless or plug-in. Front door to the condo is in an enclosed area which is dry and protected on a rainy day. you step off the elevator to the front door of the condo. Full kitchen with top-line kitchen accessories. Large 25 foot wide balcony containg two cushioned chaise lounges, two cushioned chiars with ottomans, and glass-yop table. Four comfortable Tommy Bahama beach chairs and cooler in unit for use during your stay. Binoculars provided for balcony viewing. Upgraded kitchen with stainless appliances, Cuisinart and KitchenAid accessories, top-of-line cookware, and dinnerware. Iron, ironing board, and hair dryer also provided for guests. Large sliding mirrored closet, double sink, and cushioned bench seating in master bath. Second full bath also has a full-size tub with shower. Beautiful artwork and large tropical plants throughout the unit. Professionally furnished and decorated by Beach Imports of Panama City. It was perfect for us. Great location. Close to many good eating places. Not a lot of traffic on this end of the beach. Beach was great. Would stay here again. An incredibly comfortable unit with amazing views from the large balcony. Owner was always available and very responsive. Conveniently located to everything you might need. Hope to get back again and again! The view from the huge condo balcony was amazing and breath taking. The kids loved the bunk beds, said they where very comfortable. The master bed was comfortable as well, and the fact you can lay in bed and see the ocean was an added bonus. Kitchen was stocked well. Husband feel in love with the power recliner(thanks alot for that he now wants to purchase one lol). Being on the 21st floor I was a little worried about wait times for elevator but I was surprised they where actually very fast and we never waited long at all. The entire condo was very clean and well maintained. Communication with the owner was easy and he was helpful and responsive. My family and I will definitely stay here in the future. We highly recommend staying here. The room had a great view and was a great place to stay. The only complaint I could give was the bed was a little too firm for my taste but overall a great stay. Game room and full-workout facilities on-site at Seychelles. Free cleaning with weekly / Saturday to Saturday rentals. All others add $75.00 cleaning fee. 4PM check-in / 10am check-out (you will be called or texted as soon as the condo has been cleaned and prepared for your arrival which in most cases allows an earlier check-in). Reservations cancelled within two weeks of planned arrival date will receive full refund of all payments.